Find out more and buy tickets in advance. Visit us! Find out more on our Facebook page. The Museum is an exciting place. It is both a facility as well as a concept. It is both a reality as well as a dream. It is a never-ending treasure hunt for answers to questions. It is a constant amazement and appreciation of this blue and green planet we call Earth. 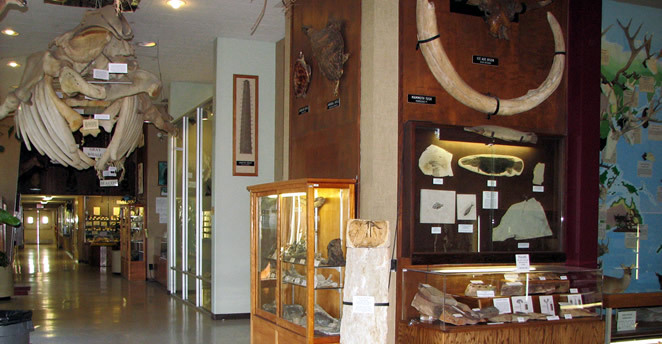 The Museum's major focus is, of course, the study of natural history. Its primary participants are the students of Sierra College who attend classes, field courses, lectures, seminars and demonstrations. But there's much available for everyone. The Museum is also a favorite place of the regional public. Thousands each year attend seminars, programs, field trips and activities sponsored by the Museum and designed specifically for the public. The Museum is open during regular college semester hours during the week, usually 7am to 9pm Monday through Thursday, and 5pm on Fridays. 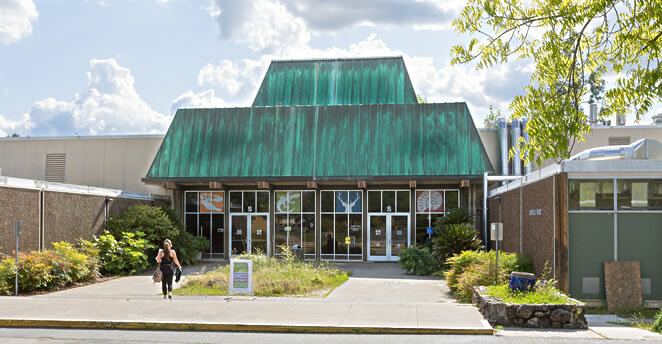 It is open on Saturdays when classes are session, usually 8am to noon, but closed on holidays and college closures. Because there are classes in session in the building, we ask that visitors be quiet as they explore. Volunteer docent-led tours are available to classes or groups, but be aware they are booked far in advance. Summers the building is open 7am to 1pm, Mon.-Thur., closed Fridays, Saturdays and Sundays. 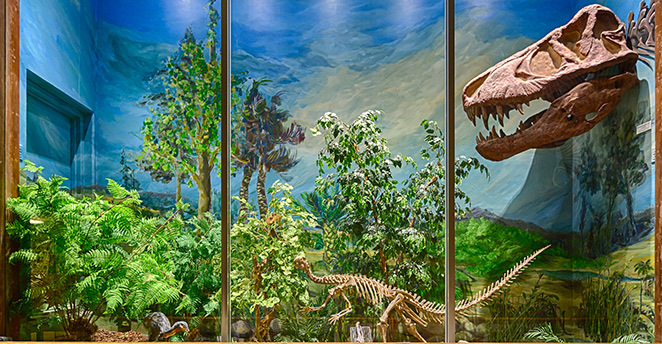 Outside there are mining exhibits, desert gardens, a Rock Walk and sidewalk drawings of large extinct creatures, which are available all the time. Become a member of the Museum and help us become even better! 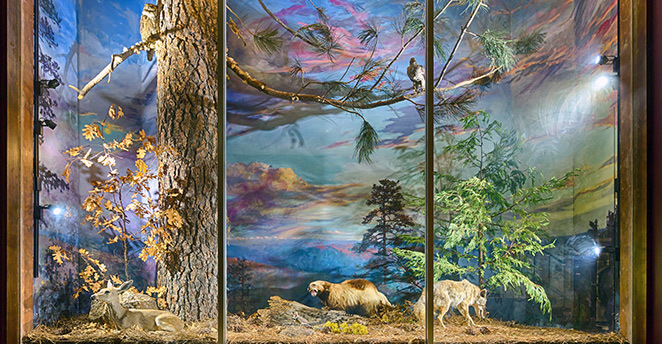 "Your museum is the most wonderful natural history museum I have ever visited. I like it better than the Page Museum, and even more than my previous favorite, the Burke Memorial. Yours is now my favorite, and I don't see how anything could beat it. Great displays, good signage, excellent preparation, imagination, and just the most marvellous fossils! And local ones so students can appreciate the natural wonders of our own region. Nice garden in front, really great rock walk, and those white outlines of Titanoboa and Phobosuchus on the pavement—what a great idea! How wonderful for the students." If you are coming with a group, please contact us first. 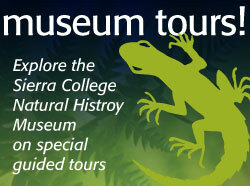 For a guided tour, call (916) 660-7924 and leave a message. Tours are only given during the Fall and Spring semesters. 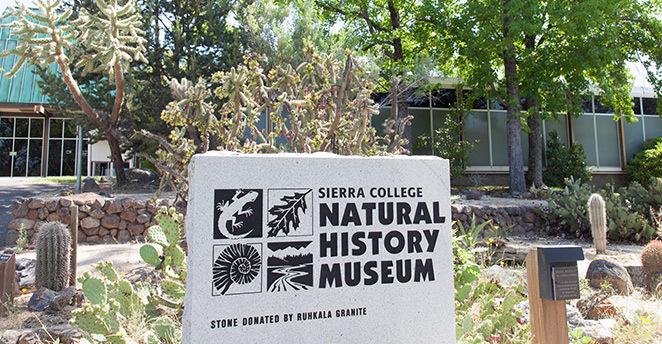 The Journal of the Sierra College Natural History Museum has articles and photos relating to science and natural history. Also online is Snowy Range Reflections: a Journal of Sierra Nevada History and Biography. Each issue concerns interesting and historic information and photos about the Sierra Nevada. Do you have some spare time and want to personally help the Museum?